We provided a FREE Workplace Assessment to make sure you have the right tool for the right job. UNSURE WHAT MACHINE IS RIGHT FOR YOUR BUSINESS? 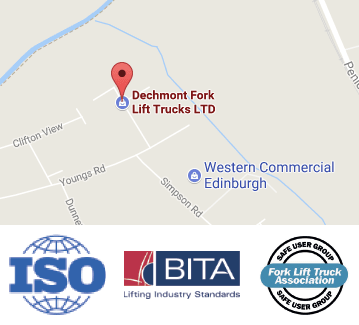 Dechmont Forklift Trucks carry a stock of New CAT Forklift Trucks and a variety of Used Forklift Trucks for all applications at our depot in Broxburn which enables us to deliver requirements very quickly, with our transport always at our disposal to allow quick and prompt delivery. Our fleet of Trucks are of a mixture of Gas, Diesel and Electric Lift Trucks, all of which are fully maintained and all are supplied with Thorough Examination Certificates. 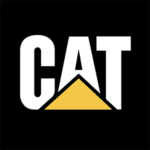 The majority of our Fleet of Fork Lift Trucks are CAT Lift Trucks and all have various mast options. Our ethos is to ensure a wide choice of Trucks with expert advice to ensure the RIGHT TRUCK for the application and requirements. We, therefore, have a wide number and variety of new forklift trucks and used forklift trucks in stock at all times. LPG Gas Counterbalance Forklift Trucks with Capacities ranging from 1 Ton to 6 Tons. The various mast options range from 3.0 Meters Duplex mast with Side Shift to 6 Meters Full Free Lift mast with side shift depending on your requirements. Other mast sizes are available. Diesel Counterbalance Forklift Trucks with Capacities ranging from 1 Ton to 10 Ton. The various mast options range from 3.0 Meters Duplex mast with side shift to 6 Meters Full Free Lift mast with side shift depending on your requirements. Other mast sizes are available. Electric Counterbalance Battery Powered Forklift Trucks with Capacities ranging from 1 Ton to 10 Ton. The various mast options range from 3.00 Meter Duplex mast with side shift to 6 Meter Full Free Lift mast with side shift depending on your requirement. Other mast sizes are available. We have a full range of Reach Trucks and all Battery Powered Warehouse Equipment which would be required for all different types of usage with various mast options depending on your requirements. 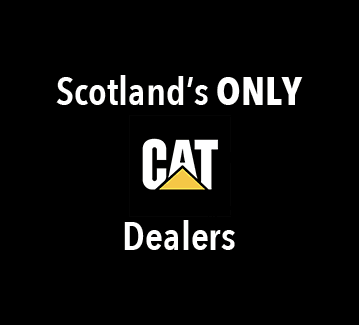 We have in stock a variety of New CAT LPG Gas Powered Counterbalance Forklift Trucks ranging from 1 Ton to 5 Tons for Sale with various masts to suit customers’ requirements. We have in stock a variety of New CAT Diesel Powered Counterbalance Forklift Trucks ranging from 1 Ton to 10 Tons with various masts to suit customers’ requirements and also a variety of Electric Battery Powered Forklift Trucks with the various mast to suit customers’ requirements. At Dechmont Forklift Trucks we understand that businesses may require our machinery for a variety of reasons, so we make sure we always have as wide a choice of forklift hire machinery on offer as possible, as well as flexibility in the time frames customers can hire for. Your business may have experienced a temporary or seasonal upsurge in activity, you may have expansion plans, or you may simply need to re-organise your stock. Whatever the reasons, we have the knowledge and experience to provide you with forklift hire that suits your needs at competitive prices.